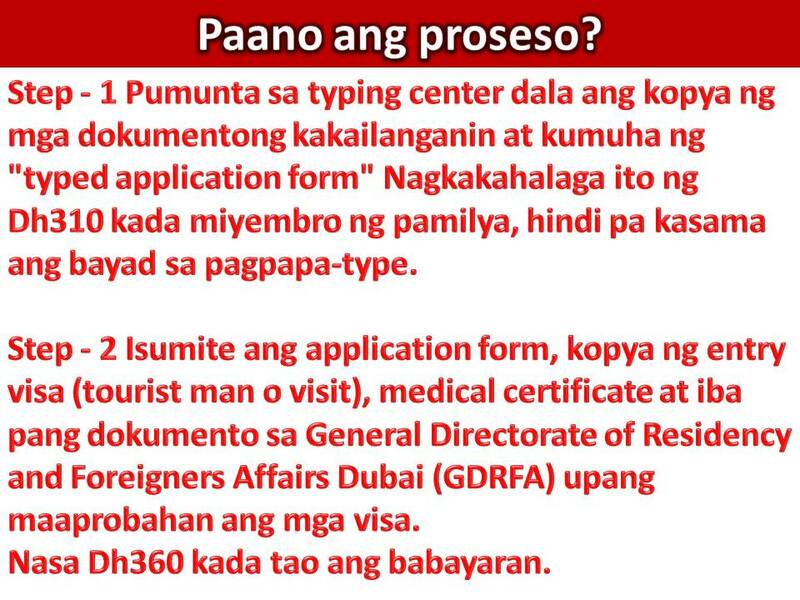 THOUGHTSKOTO Thoughtskoto : OFWs in UAE Here's How to Get Residence Visa for Your Wife/Husband and Children! 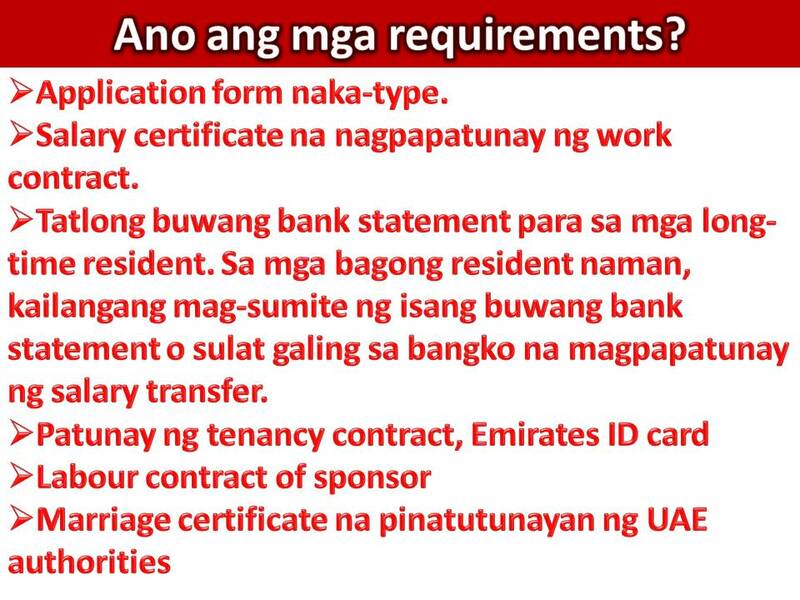 OFWs in UAE Here's How to Get Residence Visa for Your Wife/Husband and Children! Leaving a family behind is the most painful part of being an Overseas Filipino Workers (OFWs). 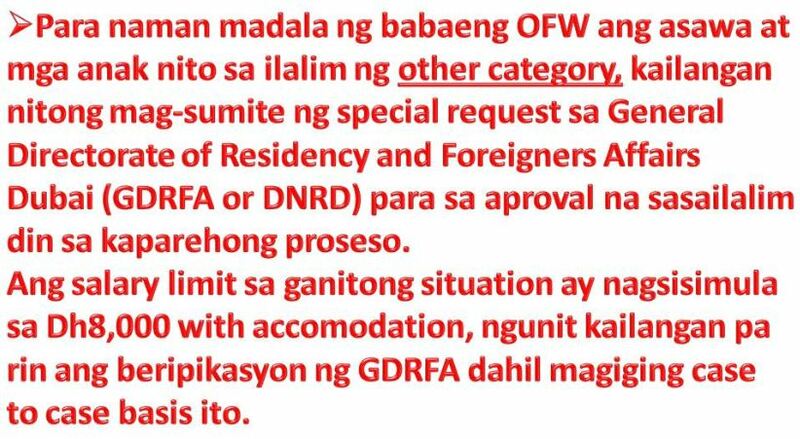 Not all OFWs are lucky enough to bring their wives, husband or children to the country where they are working. 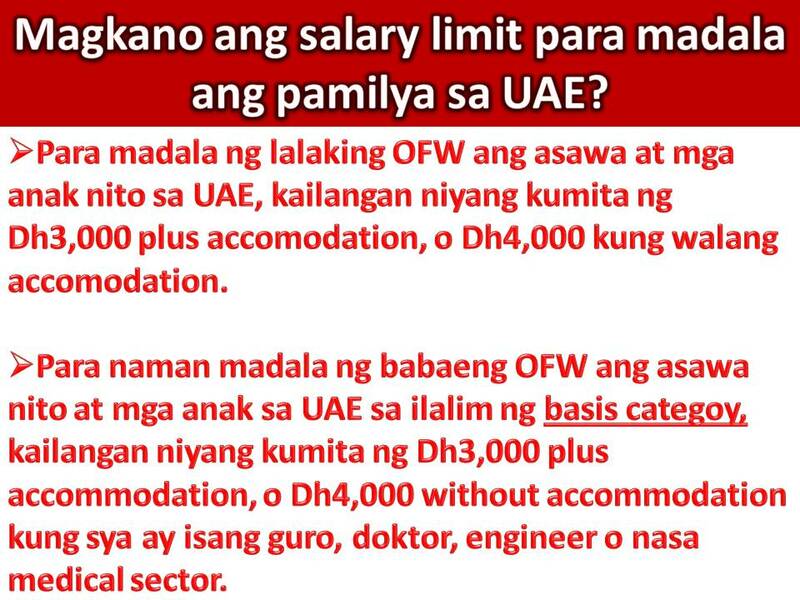 However, there are countries like the United Arab Emirates that gives the opportunity to their migrant workers including OFWs to bring their families as long as they can meet the requirements. 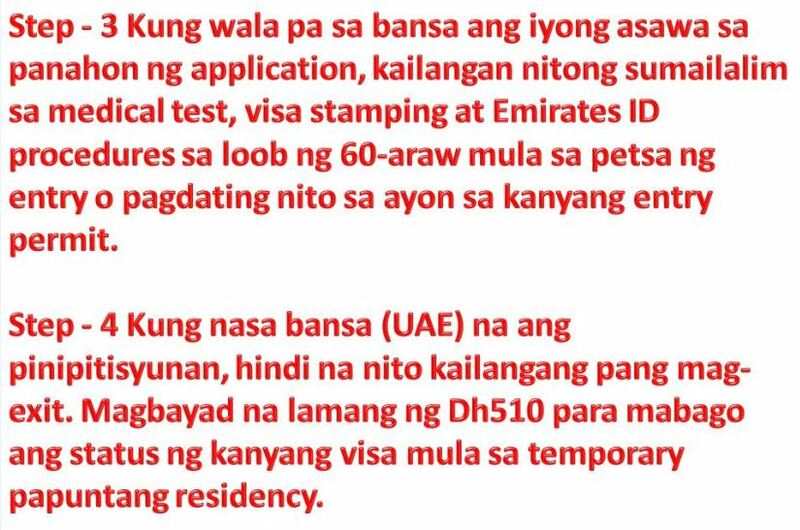 Here's the simple guide that will help OFWs in UAE determine if they can sponsor and get a residency visa for their family to be with them. WHAT IS THE SALARY LIMITS? For a husband to sponsor his wife and children, he needs to be earning Dh3,000 plus accommodation or Dh4,000 without accommodation. For a wife to sponsor her husband and children, she should be earning Dh3,000 plus accommodation, or Dh4,000 without accommodation - if she is a teacher, doctor, engineer or in any medical sector-role. For women who work in other categories, a special request needs to be submitted to General Directorate of Residency and Foreigners Affairs Dubai (GDRFA or DNRD) for approval after which the processes are the same. The salary limit in this case usually starts at Dh8,000 with accommodation, but this needs to be verified with GDRFA as the approvals are given on a case to case basis. Passports (original) and copies of both sponsor and family member/s. Approval from GDRFA in case of the other category of employment for women. Step 1 - Go to a typing center with copies of all relevant documents and get a typed up application form. It will cost around Dh310 per family member not inclusive of typing charges. 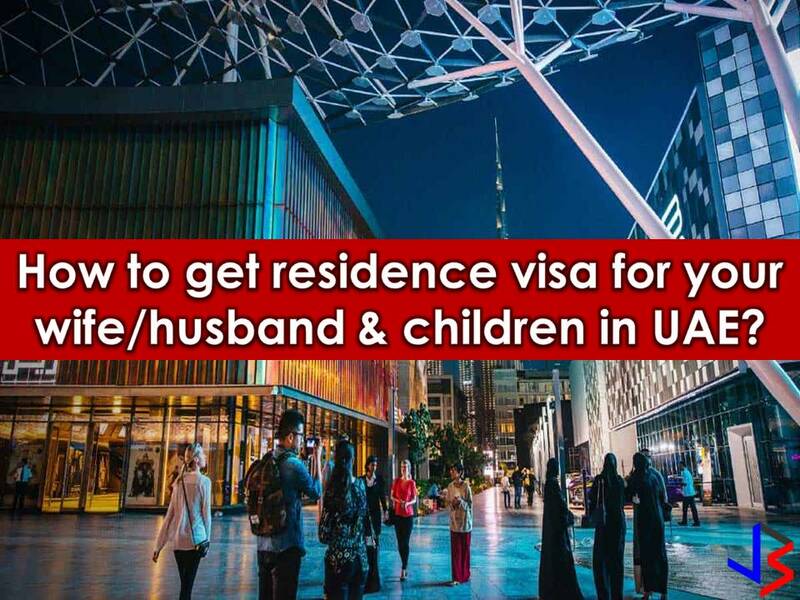 Step 2 - Submit the application form, copy of entry visa (tourist or visit), medical certificate and all other documents at the General Directorate of Residency and Foreigners Affairs Dubai (GDRFA) to get the visa approved. The total visa fee is around Dh360 per person. Step 3 - If your spouse is not in the country at the time of application, he or she has to complete medical tests, visa stamping and Emirates ID procedures within 60 days of the date of entry as given in the entry permit. Step 4 - If your spouse is in the country, he or she need not exit the country. Pay Dh510 to change the status of the visa from temporary to residency without leaving the UAE. HOW MUCH IS THE EXCHANGE RATE TODAY? Former OFW Lost P8 Million To "Budol-Budol"
Brain Aneurysm: What You Need To Know?